The speed we found this weekend is a pleasant surprise. I would have expected an easy Mercedes 1-2, with our boys over 0,5s behind Lewis in qualy. The car looks good, both Seb and Kimi look fast enough to give Hamilton a hard job today. Bottas's distant 4th shows he doesn't have the speed to challenge for a win today. Only scenario for him is passing Kimi at the start and hope Lewis is giving presents for all the help. For us a good start is key for both our guys. Kimi can win this if he gets past Lewis with the faster tire and give himself a good margin to close it out with the chosen harder tire compound in the 2nd half. Seb can win this if he doesn't get stuck too much time behind Ricciardo and Bottas and of course him being faster than Kimi and Lewis. Hamilton's has the best chance here, he just needs to keep Kimi behind until the pitstop. He will have the faster tire towards the end and can just manage the gap if he comes out 1st out of the pitstop entries. Last edited by IulianFerrari; 21st October 2018 at 13:41. 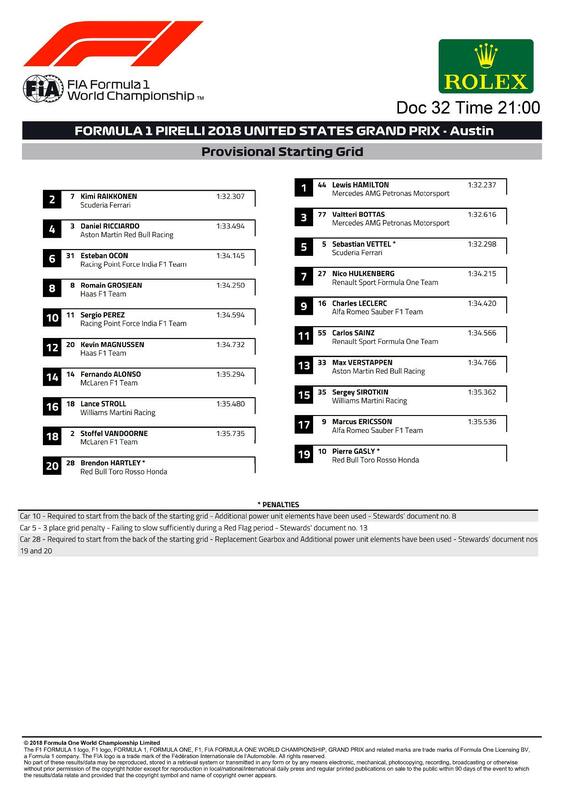 Just to make things interesting Pirelli have increased the minimum rear tyre pressures from 20psi to 21.5psi (slicks), consequentially that'll likely require teams to adjust the fronts above the minimum too (which is 21psi). why would they all of a sudden do this??? i'm SURE it's for safety purposes......right!!!!! Nothing has changed from two weeks ago. For even to have a small chance at the WCC Merc has to have DNFs, at least two. 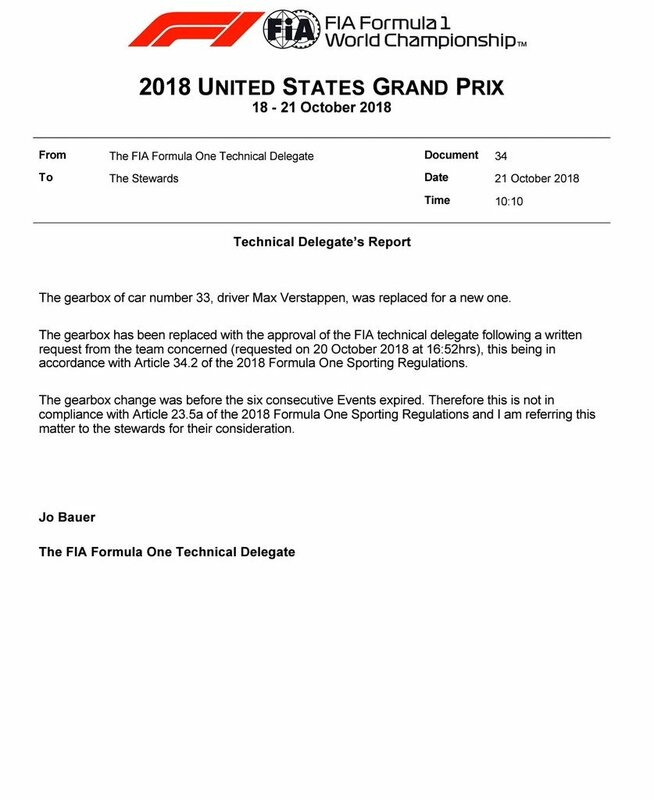 Merc doesn't need to win anymore races. They take the WCC with four 3-4 finishes (they can even afford to be 4th and 5th once). most of the rumors as to why ferrari are suddenly closer to mercs again is that the updates they brought to help with tyre blistering and more pace after monza has been an epic fail. all the changes made the car unbalanced and hard to drive whilst being slightly better on tyres so trading speed for longer tyre use. Pirelli up to their usual shenanigans, increasing tyre pressure means reducing overall grip and temperature. I don't know if increasing tyre pressure affects Ferrari but why change it now? Probably they want to make sure Hamilton clings his 5th title today. Yeah, because 12 pieces of gravel on the track was SOOOOOOOOOOO dangerous. omg!! This. Something is fishy....I’ve always said it and always will. Hamilton’s championships are all fake. For some reason they are doing everything possible to make sure he wins this weekend. New water pumps on both Mercs.. they had a leak. of course with it being Mercedes it NEVER happens in the race. Seems odd that Pirelli have changed the tyre pressures so close to the race, we are a suspicious lot and it's hardly surprising, am I being naive to think it may be due to the lack of data after the wet FP runs? Or just another way of tipping the balance once again towards a HAM victory. Good luck ragazzi, let's show them we're still fighting. We run the package the FIA tell us too so it helps Merc, everything we do is controlled by FIA. Something strange is happening with Ferrari's pace. I wonder if we where allowed to use something we couldn't in recent weeks, there is just to much difference, some sidepods can't get you that kind of gain. As for the not working upgrades, I think the team can see that in a weekend and if they don' t bring time gain, not use them. You can say this weekend wasnt enough time to see if upgrades work or not, but what about recent races, surely if upgrades didnt work the team would have enough data to see that. Last edited by IulianFerrari; 21st October 2018 at 16:29.